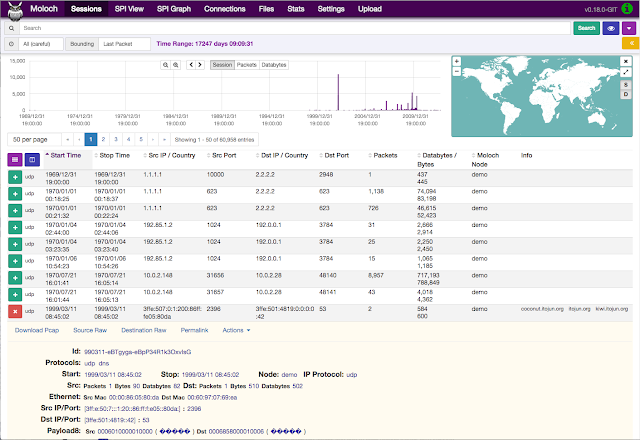 Moloch is an open source, large scale, full packet capturing, indexing, and database system. Moloch augments your current security infrastructure to store and index network traffic in standard PCAP format, providing fast, indexed access. 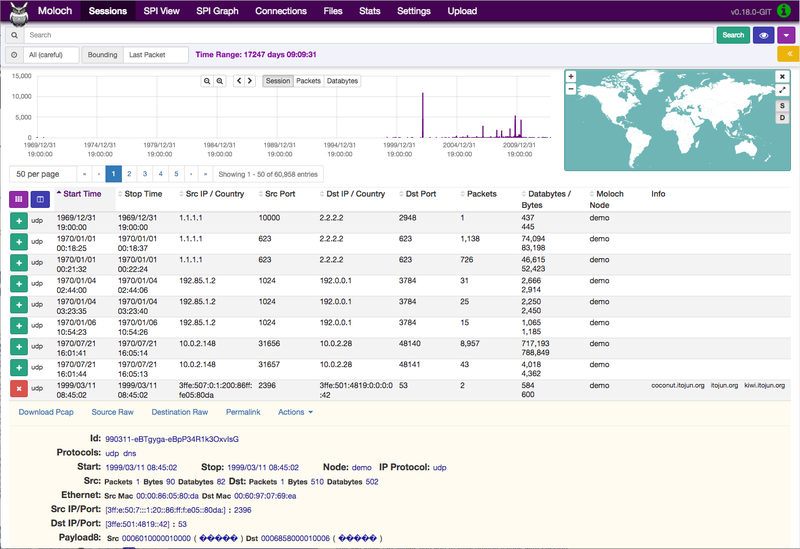 An intuitive and simple web interface is provided for PCAP browsing, searching, and exporting. Moloch exposes APIs which allow for PCAP data and JSON formatted session data to be downloaded and consumed directly. Moloch stores and exports all packets in standard PCAP format allow you to also use your favorite PCAP ingesting tools, such as wireshark, during your analysis workflow. Access to Moloch is protected by using HTTPS with digest passwords or by using an authentication providing web server proxy. 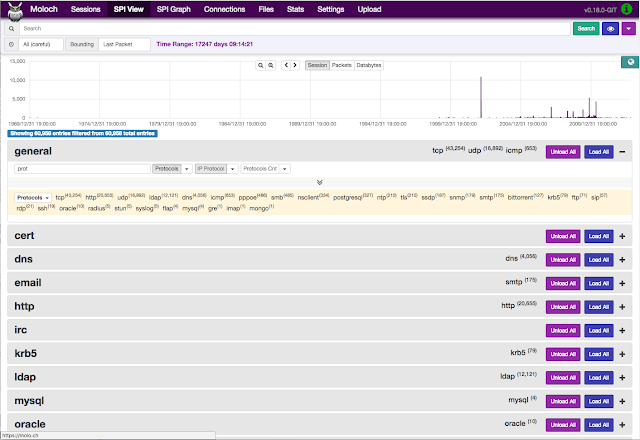 All PCAPs are stored on the sensors and are only accessed using the Moloch interface or API. Moloch is not meant to replace an IDS but instead work along side them to store and index all the network traffic in standard PCAP format, providing fast access. Moloch is built to be deployed across many systems and can scale to handle tens of gigabits/sec of traffic. PCAP retention is based on available sensor disk space. Meta data retention is based on the Elasticsearch cluster scale. Both can be increased at anytime and are under your complete control. For advanced users, if you wish to build Moloch yourself run ./easybutton-build.sh --install which will download all the prerequisites, build, and install. make config can be used to perform a initial moloch configuration. The RPM & DEB files are much easier to deal with then building yourself and are recommended. 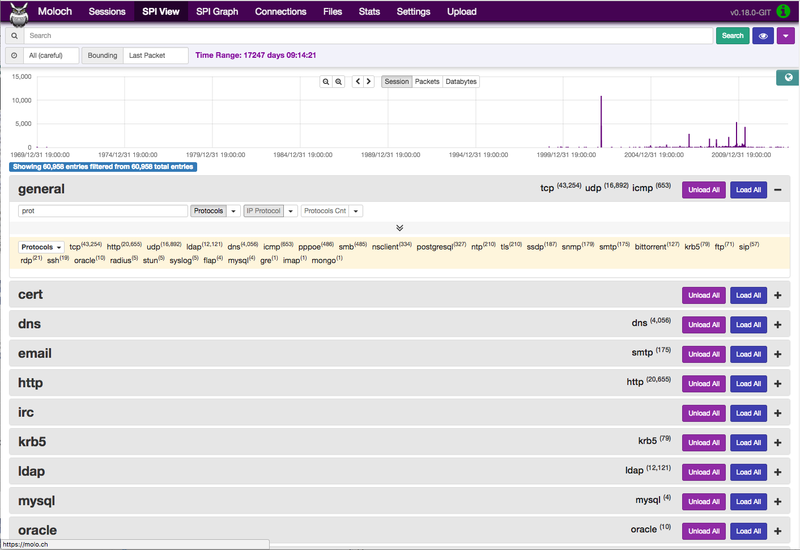 capture - A threaded C application that monitors network traffic, writes PCAP formatted files to disk, parses the captured packets and sends meta data (SPI data) to elasticsearch. viewer - A node.js application that runs per capture machine and handles the web interface and transfer of PCAP files. elasticsearch - The search database technology powering Moloch. Moloch is a complex system to build and install manually. The following are rough guidelines. Recommended version 5.6.x for Moloch 0.18 and later. Download elasticsearch. Important: At this time all development is done with elasticsearch 5.6.7. Use the ./easybutton-build.sh script to download all thirdparty libraries and build moloch. In the viewer directory run npm install. Make sure you download the latest freely available GeoIP and RIR files. Edit the db/daily.sh script, and set it up in the crontab on one machine. If you've made it this far, you are awesome! On each capture machine you need to run at least one moloch-capture and one moloch-viewer. Using make config will create startup files, or you can find the source files for make config in the release directory. Point your browser to any Moloch instance at https://<hostname>:<port> and start tinkering! Moloch is built to run across many machines for large deployments. For demo, small network, or home installations everything on a single machine is fine. For larger installations please see the FAQ for recomended configurations. The following are rough guidelines for capturing large amounts of data with high bit rates, obviously tailor for your specific situation. It is not recommended to run the capture and elasticsearch processes on the same machines for highly utilized GigE networks. Here is an example system setup for monitoring 8x GigE highly-utilized networks, with an average of ~5 Gigabit/sec, with ~7 days of pcap storage. Moloch machines should be locked down, however they need to talk to each other (port 8005), to the elasticsearch machines (ports 9200-920x), and the web interface needs to be open (port 8005). Moloch viewer should be configured to use SSL. It's easiest to use a single certificate with multiple DNs. Make sure you protect the cert on the filesystem with proper file permissions. It is possible to set up a Moloch viewer on a machine that doesn't capture any data that gateways all requests. A shared password stored in the Moloch configuration file is used to encrypt password hashes AND for inter-Moloch communication. Make sure you protect the config file on the filesystem with proper file permissions. Encrypted password hashes are used so a new password hash can not be inserted into elasticsearch directly in case it hasn't been secured. For answers to frequently asked questions, please see the FAQ. We use GitHub’s built-in wiki located at https://github.com/aol/moloch/wiki. Upgrading is easy if using the RPM/DEB files. If upgrading from source it is a manual process. Build the moloch system using "easybutton-build.sh"
Run "npm update" in the viewer directory if not using "make install"